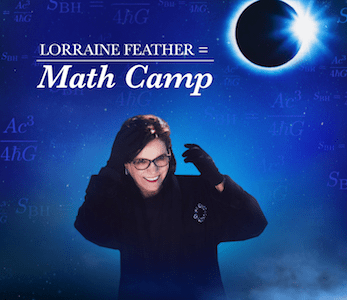 Math Camp is lyricist/jazz singer Lorraine Feather’s 12th all-original album, and this time her inspiration is math and physics, a theme that winds through ten songs. The album was produced by Feather and longtime co-writer Eddie Arkin, who composed the music for seven of the songs, the other three written with Shelly Berg, another frequent collaborator. I was never any good at math, and have never taken a physics class, but a few years ago I realized what fascinating subjects they were. I first heard the term “math camp” on an episode of the TV show Frasier. In 2015, I wrote a lyric for Eddie Arkin to write music to. It’s about two people well into the throes of a love affair, alternately joyous and miserable. I had decided I wanted to call the project Math Camp. When I come up with an album concept, I don’t feel it has to be overtly reflected in every tune, but I noticed that the last talking section of “I Don’t Mean” contained most of the numbers between zero and ten; I added the rest. loop played by Tony Morales, played here on the recording by Mike Shapiro. In arranging the track, I thought it would work great with a rhythm section featuring two guitars in place of piano. The rhythm guitar part gives a nod to what jazz musicians like to refer to as a “Freddie Green style,” and the lead guitar, played by Grant Geissman, features a tremolo effect used in early rockabilly and later on in Twin Peaks. I imagine the woman in the story as an artist, the man as an academic; the song jumps around in time. I read a piece in Quanta magazine, written by Natalie Wolchover, entitled “A Fight for the Soul of Science.” At the top was a photo of a physicists’ meeting in Munich, in which physicist George Ellis is seen sitting with his head leaning on his hand as if in despair. The gist was that scientists lacked the equipment to help them figure out the deepest secrets of the universe. In “HMB,” the physicist obsessed with trying to figure out a “theory of everything” is a woman, who comes home to her husband and dog after a day of research. I never would have thought of putting a Latin section in the middle of this song, It blew me away when Eddie came up with it. I originally called this “Negative Ions.” As the lyrics evolved, I changed the title to “Euphoria.” The song is about the ebb and flow of emotions, the way joy can overtake us for no apparent reason. The album’s title tune is about two people who meet in a bar. The guy is a math geek. As they exchange life stories, he tells her about his boyhood student as a “mathlete,” and bewitches her with a riddle, which I took directly from a Math Camp Qualifying Quiz. I added the name Angela. The round at the end has three parts: A snippet of basic information about electromagnetism that I took from physicsforidiots.com, the beginning digits of pi, and a quote by Albert Einstein. I wrote the final three songs for the album with Shelly Berg. Shelly was in New York doing a Jazz at Lincoln Center concert, and we were able to snag a rehearsal room for four hours, during which time he wrote the music for “I’ll See You Yesterday” and “It All Adds Up” to lyrics I’d brought. Shelly had thought it might be nice to have clarinet double Russell Ferrante’s piano line. I knew that Dan Higgins would be perfect; I was amazed at how quickly Dan locked in with Russ on this track. Eddie and I wrote “The Rules Don’t Apply” for the 2016 film Rules Don’t Apply, starring and produced by Warren Beatty. Lily Collins sang it at the piano in the film, and it’s then heard in part twice more, and in full over the end credits. It was nominated for a Critics’ Choice Award. ‘in a Hot Minute” begins with a quote from Neil de Grasse Tyson’s wildly popular Astrophysics for People in a Hurry. This quote, for me, is an example of what’s so exciting about physics. I wanted to use the word “hot” in the title, to reference the time when the universe was so hot that particles couldn’t even coalesce into the building blocks of atoms. When Shelly and I were winding up our writing at Lincoln Center, I asked him if he had time to write the music for a third lyric I had in progress. He emailed me a few days later, with music for the entire thing. I loved it right off the bat. The second verse is about the first experimental test, performed by Sir Arthur Eddington during a solar eclipse, of Einstein’s general theory of relativity. The following Monday morning, The New York Times headline read: “Lights All Askew in the Heavens,” the first sub-headline continuing, “Men of Science More or Less Agog Over Results of Eclipse Observations.” The centennial of this experiment, I discovered after we completed the song, is coming up on May 29, 2019. “A couple of years ago, Lorraine moved to the east coast. When we began to write the songs for this album, we thought it might be interesting to record half the tracks with an east coast band and half with the west coast band we’ve worked with on her previous releases, and we did. What I experienced was a commonality of artistry and excellence from all the players involved in the making of Math Camp. I greatly appreciated the beautiful engineering on both coasts and the wonderful mix.